You can use wholewheat flour instead of spelt flour if you prefer, but the spelt flour gives a lighter texture. These are a great snack: low in sugar but sweet because of the dates. Instead of dates, I also sometimes use the equivalent weight (150gr) in chopped apple, mashed banana or grated carrot, or blueberries. 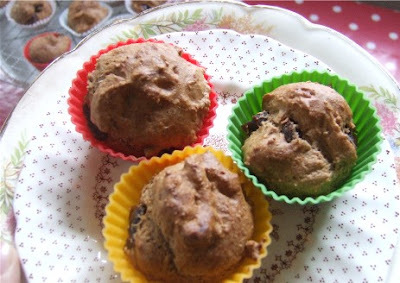 This recipe makes 12 small, tasty, low GI muffins. Hi WRW, I have just discovered your second blog, food-related, always a thrill! I am an ex-vegetarian who still thinks like one. I try and cook with spelt and I am a little dairy-intolerant, so am happy with vegan recipes. My latest thing is cupcakes - ever made vegan versions? Check these out for inspiration: http://cupcakestakethecake.blogspot.com. PS I have also encountered that vegetarian thing in Ireland whenever I visit since I only eat kosher meat, not widely available anywhere near where my Dad lives! I tend to subsist on smoked salmon and Brack... Not the healthiest diet but very very tasty. God, Tania, I need to set up an alert for comments to this blog. I'm only discovering you here now!! Smoked salmon and brack. That is hilariuos!